Saturn's rings: To scale, thinner than paper. Just How Thin Are Saturn’s Rings? 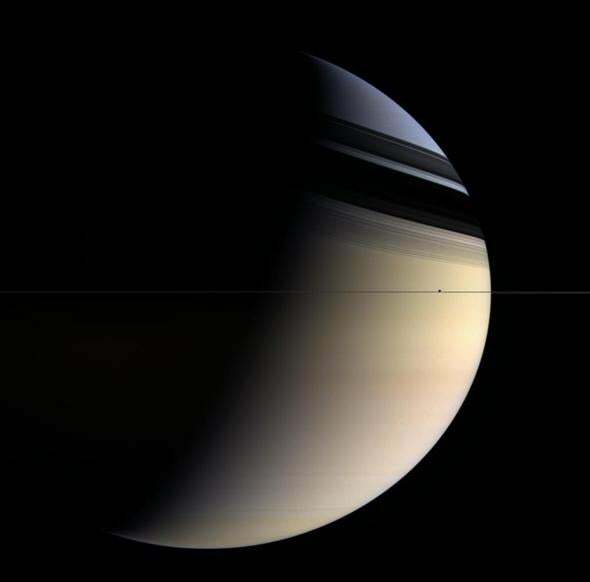 Saturn’s rings are so thin that when seen edge-on they practically disappear, even to the Cassini spacecraft. They barely reveal their presence in this shot, though the shadows they cast on the planet itself makes it easier. Note: A version of this article originally appeared on my Google Plus page, but rumor has it G+ may be going the way of phlogiston and N-rays. I didn’t want to lose this article, since it’s one of the coolest facts about our solar system, so I figured I’d update it and put it here on the blog. That way I can link to it when I talk about Saturn’s rings. The planet Saturn is beyond question the jewel of the solar system. Its magnificent system of rings is awe-inspiring, composed of countless tiny particles of water ice, each orbiting the gas giant planet individually. Sculpted by the gravity of the planet and the orbital dances of dozens of moons, the rings are divided into a few major rings and thousands of narrower ringlets. They’re also huge: The main ring system spans 300,000 kilometers (180,000 miles), and some fainter rings are cast even wider! But they’re also amazingly flat. Seriously, truly flat: Observations indicate they are only 10 meters (32 feet) thick in some places, up to as much as a kilometer (0.6 miles) in others. That’s more than just flat. That’s practically two-dimensional! Let me show you why. Let’s take the bigger number, and assume the rings are a kilometer thick. If the main rings are 300,000 kilometers across, that makes the thickness-to-width ratio 1 in 300,000, or 0.0000033. How thin is that? Well, a common simile used for thinness is a sheet of paper (i.e., “paper thin”). But how thin is that? A standard sheet of US writing paper has dimensions of 8.5 x 11 inches (about 22 x 28 cm) in width and height, and (for 20 pound paper) only about 0.004 inches (0.1 mm) in thickness. Even if we use the larger dimension of 11 inches, the thickness-to-width ratio of a piece of paper is then 0.00036, over 100 times the ratio of Saturn’s rings! In other words, to scale, a piece of paper is 100 times thicker than Saturn’s rings. And that’s using the thicker number for the rings, 1 km instead of 10 meters. If we go with the thinner number, the ratio jumps another factor of 100, so a piece of paper is 10,000 times thicker than Saturn’s ring, to scale! Want to think of it another way? If you wanted to make a scale model of Saturn’s rings using paper, you’d have to use a sheet 10,000 x 11 inches = 1.7 miles across! It’s truly astonishing that a structure so huge, so vast—it stretches more than three-fourths of the distance from the Earth to the Moon!—can be so ethereally thin. But that’s physics at work. The particles forming the rings may have once had all different tilts as they orbited Saturn, but if they did, they would have collided with each other. The details are a bit complicated, but collisions would steal angular momentum from the particles, and their orbits would tend to flatten out. This kept happening until the particles were spread out so thinly that collisions stopped occurring, which happens when the rings were only a few times thicker than the size of the biggest particles in them—a few meters across. That’s why the rings are so thin. Once again, processes in physics are both vast and subtle, and what seems surprising to our intuition is actually inevitable in reality. That’s one of the many reasons I rely more on science than in our own easily fooled human brains! Science is a way of helping you understand the Universe, but it’s also a way of helping you trust it. It always follows its own rules.